Machen Sie einen glitzernden Spaziergang auf dem Las Vegas Strip vom Bellagio Las Vegas zum Excalibur Hotel & Casino. Sie werden an der Seite eines Fotografen spazieren gehen, der unterwegs Souvenirfotos schießen kann, mit Stopps an einigen der überragendsten Orte Las Vegas, darunter der Bellagio-Wintergarten, Skulpturen im Freien und ein gewaltiger Wasserfall. 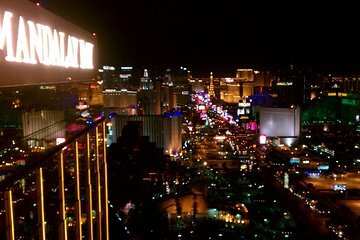 Da diese Tour einen VIP-Eintritt in den Foundation Room oder die LIGHT Vegas Clubs beinhaltet, ist es eine großartige Möglichkeit, eine unvergessliche Nacht in der Stadt zu beginnen. I really liked this tour, and my husband did too eventually. At first it wasn't his thing to walk around and have someone take pictures of us, but Craig was so nice and sincere, and didn't push anything on us that we didn't want to do or see, and he was very informative. We only had one day left in Vegas, and if we hadn't met him, we wouldn't have known about a few other things that we would never have gone to see without this tour. Showed us lots of great secrets of the strip! Great pictures and great attitude! Photographer brought along intern, who didn't add anything to our experience. Intern featured in most of our group pictures too which was not ideal. Annie our English guide was great...saw lots and good info. Amazing tour. My husband and I truly enjoyed it. Our guide was the best, he was super helpful, kind and knowledgeable. We want to go back and do it again! !